Point of order mate - 'Wearside Jack' was not a Geordie!! By pure coincidence I spotted a Mini down a driveway last Wednesday night when cycling through the village in the dark after visiting the Wheatsheaf across the bridge - yours? It was dark at the time but silver on black plates and (?) tweed grey? I've a Mk1, a Mk 4 and a pale blue Elan + 2 and white S2 Alfa Spider which you may have seen about. do you know Mr Winder? Yep, that would of been mine...unless there's another I don't know about! I'm just opposite the pub car park but I've no off road (or on road come to that) parking at mine so I keep my assorted stuff over the road where the Mini was, Mini in the garden, Land Rover and my Skoda dumped somewhere around about on the road. I can't say I've noticed your jallopies around, I'm sure I'd of remembered if I had spotted the Mini's or the Elan...Alfa maybe not so much! I don't think I know a Mr Winder, though if he's in the village I might know him by sight if not name? Watched David Healy many times for Leeds. Nice bloke, top player and a well deserved MBE. 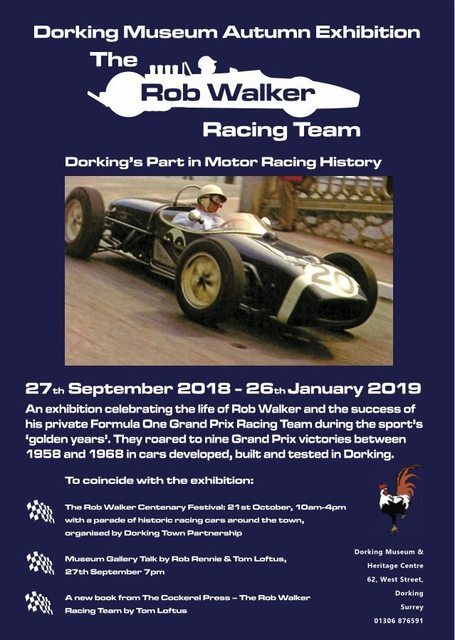 The Rob Walker Racing Team – Dorking’s Part in Motor Racing History is at Dorking Museum from 27th September to 26th January 2019. "Rob Walker chose Dorking in Surrey as the base for his small private racing team during the 1950s and 60s, the golden age of motor racing, and it was here that his cars were developed, built and tested. Rob Walker was the first, and almost certainly the last, private team owner to win a Formula One World Championship Grand Prix. And he did it not once, but nine times between 1958 and 1968, a period regarded by many as the sport’s golden years. Not just F1, his team was also successful in many other levels of motorsport, including F2, F3, sports car racing and hill climbs. Since the world’s first purpose-built racing circuit, Brooklands, opened in Weybridge in 1906, Surrey was the focus for Britain’s pioneering racing car industry. So, Dorking provided the perfect location to attract the skilled mechanics and drivers Rob required. 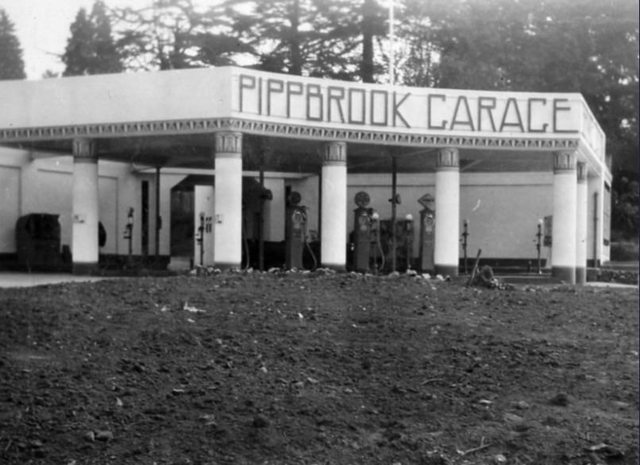 In 1947, he bought Pippbrook Garage and workshops in nearby London Road which became the base for the fledgling Rob Walker Racing Team." All from Littleborough or a few miles away from me. Must be something in the Pennine air.